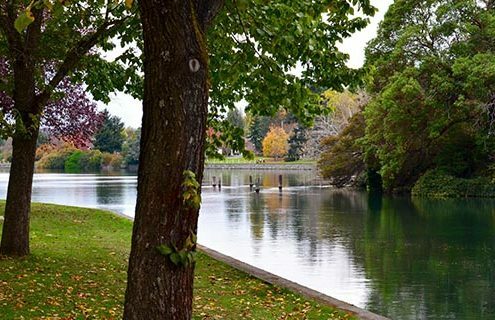 Victoria is the City of Gardens, but it could also be nicknamed the City of Parks. Despite being the most populated city on Vancouver Island, Victoria BC still has plenty of green space to take a breather and find some refuge from its urban aspects. Many of Victoria’s parks are lush year-round, and feature plenty of beautiful blossoms, trees, gardens, and benches to relax on. They’re the best place to park for a picnic, or enjoy a mid-day stroll. Check out some of the top green spaces in Victoria below! Easily one of the most visited parks in Victoria thanks to its convenient location, Thunderbird Park is found right next to the Royal B.C. Museum. The park is famous for its traditional Kwakwaka’wakw big house, the Mungo Martin House, towering totem poles and heritage Helmcken House. St. Ann’s Academy is also located nearby. Thunderbird Park has been around since 1941 and is one of the most historical parks in Victoria BC out of sheer proximity to numerous pieces of the city’s history. It’s a great place to enjoy some fresh air, while delving into Victoria BC’s interesting and cultural past. Just up from the famous Fisherman’s Wharf lies Fisherman’s Wharf Park. While still an underrated park in the city, this particular green expanse in the city is a fantastic example of space renewal and environmental sustainability. In 2009, the city set out to transform a rarely used sports field into a natural park. What they created is a fantastic rain garden, which uses storm water to feed its flourishing plants, successfully managing storm water and reusing it in a nurturing way! The park also has grassy hills to enjoy a picnic on, a boardwalk and a well-equipped, sandy playground. An afternoon spent at the Fisherman’s Wharf float homes and then in the park is the perfect family summer’s day. Topaz Park is a large expanse of green space in the Hillside Quadra neighbourhood of Victoria. Currently, the park is undergoing debates of how to revamp the space, which currently boasts four sport fields, one of which is turf, a lacrosse box, playground, off-lease dog parks and fitness equipment. It’s a great place to get the Frisbees, footballs and soccer balls out and break out a sweat. The park’s claim to fame lies in its title as host of the Victoria Highland Games, a three day long Celtic festival that takes place in May. During the Highland Games, everything Celtic takes place, from cultural instruction in things like traditional music, whiskey and history, to traditional sports like throwing hammers. One of the smallest regional parks, Gonzales Hill only has 1.4-hectares to its name. However, the views it boasts means it packs a punch in its small area. You can climb the stairs to the old Observatory, which served as a weather station for 75 years, or take the winding pathway up the hill to various vistas and viewpoints. The view shows off Victoria, the Juan de Fuca Strait, and the Olympic Mountains. Inside the park is the tallest point on the south coast of Vancouver Island, which lets you enjoy such fantastic views. Labeled “the best place to fly a kite,” Clover Point is a stunning point on the Dallas Road walkway that is a favourite for locals, especially of the kite variety. Kite fliers, hang gliders, kite surfers and wind surfers all flock to the particular point of land, as it’s a favourite spot for Victoria’s windy days. 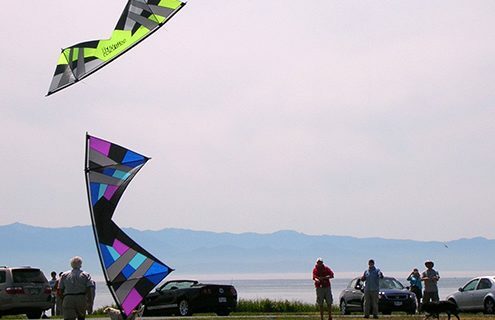 In fact, Clover Point hosts a kite flying festival every year. While the festival was unfortunately cancelled in 2017, they’re hoping to be back up in the air for 2018. Parking at Clover Point also means you’re in close proximity for an ocean-side stroll along the 1.5km Ross Bay sea wall, or a loop through the Ross Bay Cemetery. This Victoria park, located in Esquimalt, is riddled with important city history, as well as plenty of beauty. Macaulay Park started out as a farm for the Hudson Bay Company, and was part of Fort Macaulay. Eventually, it was claimed as a municipal park, and has been managed as such since 1985. Its seaside walkways open up to views of the Juan de Fuca Strait, and traces of Fort Macaulay still reside within the park. Visitors will come across former military ramparts, lookouts, defensive berms and bunkers, fit with cannons that remained unfired during both world wars. It’s a great place to dip into Victoria’s history, and to enjoy the twisting paths, hugged by various vegetation. Be aware that dogs are required to be on leash, and both visitors and dogs alike need to remain on the pathways, as the park is home to endangered, protected plant species. 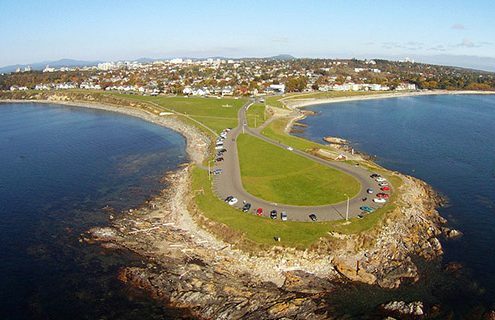 Saxe Point Park is a beautiful, seafront peninsula park with nearly 15-acres of woods, trails, lawns and gardens to enjoy. It features amenities such as picnic benches, and even has access to a small sheltered beach. 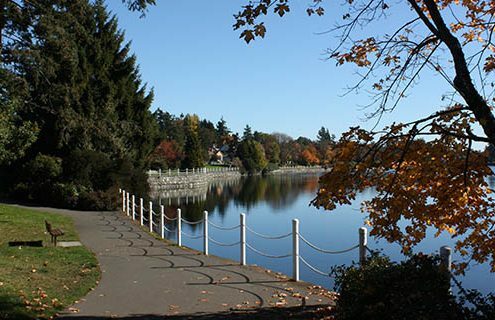 Also located in Esquimalt, across the bridge from downtown Victoria, it has been a park since 1934. It saw its own fair share of history, as during the war a number of trees on the site were cleared for a searchlight that was part of shoreline defense. Today, the park has some of the best views of the Olympic Mountains and Strait of Juan de Fuca to be found. For birdwatchers, or those who seek the solace of a quiet, outdoorsy escape, Albert Head Lagoon Park is a must. Wrapped along a small lagoon in Metchosin, the 7-hectare park also features a small pebbled beach in a protected cove, which makes a perfect picnic spot. If you’re wondering where the bird lovers come in, the lagoon is home to tons of birds both local and migratory, and the park itself is a bird sanctuary. With birds, beaches and stunning views of the Olympic Mountain Range and Washington State, it’s no surprise that Albert Head Lagoon Regional Park is a favourite for visitors to Victoria BC. For as long as it can be remembered, Gorge Park has been a hotspot for recreation, used as early as the 1860’s when the first settlers arrived in Victoria, B.C. Starting out in 1905, the 11.6-hectares of land was known as BC Electric Gorge Park. A stunning, Japanese Tea Garden was opened in 1907, but the entire area fell into disrepair until the Kinsmen Club upgraded the park, which was now owned by the Township of Esquimalt. Today, the park is a well-rounded area of forest, greenery and gardens, including a rose garden and a number of heritage trees, some of which are one-hundred years old! Plus, it’s a fantastic bird-watching destination. It’s latest feature is a nature house, which opened in 2008, providing a hands-on, educational opportunity for visitors and students! It shows off the unique ecology of the Gorge Waterway region. Gorge Park lopes along next to the Gorge Waterway for 1.7km and offers plenty of scenery, as well as art sculptures, benches, a washroom and a playground. Uplands Park is a diverse green space tucked into the Oak Bay area of Victoria BC. The 30-plus-hectares of land covers everything from ocean views and beach access, to stunning meadows of Garry Oak, a War Memorial, manicured fields and natural rocky outcrops. Networks of well-used (and well-kept) trails lace their way through the park, and there are picnic areas, as well as a scenic drive right along the ocean. Uplands Park is special to Victoria in that it is home to a large number of rare plant species. In fact, it has the greatest concentration of them in the entire country. When visiting Oak Bay, Uplands Park is an enticing spot to spend an afternoon, enjoy a quick walk, and explore the diversity of Victoria’s nature.